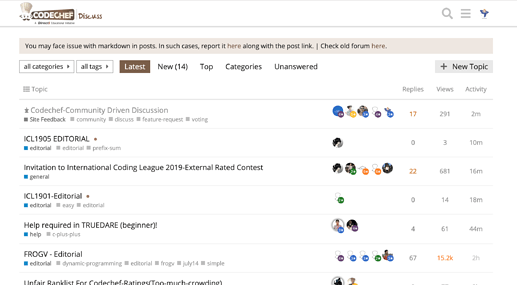 @admin Wonderful work done in making the new Codechef Discuss Forum. Revamped Look, Awesome Feel and Mobile Support. 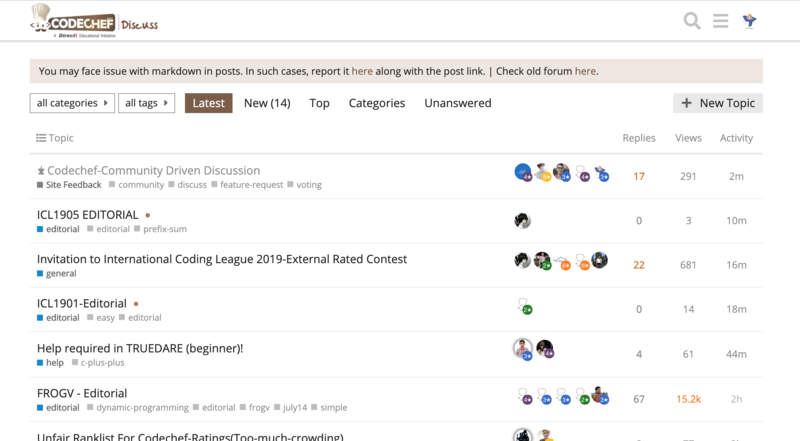 However the community has a few suggestions to make this discuss forum and the main site even better(with a poll for each feature below). Please participate wholeheartedly in the polls (No requirement to be 18+). One Vote, One Value! The entire voting is anonymous, and I doubt whether the admin’s can see whom you voted for. A number-based ranking should be included at the end for people to vote on the overall readability of the editorial. Would show how the community rates the editorial. A ‘Suggest Edits’ button like in StackOverflow to allow users to suggest edits to prettify the content and make it more readable. This could make Good editorials with Bad Formatting better readable and understandable. Suggested Edits could be approved by moderators (and reduce their work of editing it themselves). A short, yet concise guideline popup for those posting a new question on this forum. This is to reduce the number of posts(spam) that don’t help the community on the whole. Usually these questions come in the format of ‘Why is my code xxxx not working?’ These sort of questions don’t show individual effort of the author on explaining WHY the code works, whats the logic behind it and so on. Moreover, editorials are published from which they can find out the correct method. Also, implementing restrictions on accounts which violate the guidelines repeatedly will effectively reduce the number of such questions. A Link on the top of the discuss forum linking to the https://www.codechef.com/. This will help for quick navigation between the discuss and the home page. Suggestion by @aryanc403. A Copy to Clipboard button for the sample input and output of questions in Codechef. This could make copy-pasting sample test cases to a .txt file or the terminal easier. Push Notifications on the results of code submission (AC, TLE, WA, …). This will help during fast-paced contests, where time is important. A browser plugin is available, but an integrated one would be much better. Editorials should not come up on the discuss page unless the #editorial is searched for. Since a discuss forum is supposed to be a question and answer forum, the dominance of editorials in the search results make it difficult to find community asked questions. People searching for editorials of the latest questions can, in any case, search for it using the editorial tag. Notify on upload of editorial. Sometimes, after a contest, we might want to see the editorial of a particular question, but it might not have come out yet. So, a notify on Editorial upload option would help greatly. Run against sample testcases of the selected problem in Codechef IDE. Quite self explanatory and particularly useful to Codechef IDE users for testing code against the sample input provided in the question. Marvellous suggestion by @l_returns. If anyone wants to give any reasons stating the short-comings in my suggestions, you are free to explain in the comments section below! Thank you for taking out time and providing this valuable feedback and suggestion. We will surely take this into account and try to implement them as soon as possible. Please add “Back to CodeChef.” link in top left. This list has been updated with a few more suggestions. Please have a look at it and take them into consideration. A feature to hide tags in practice section. Thanks for your suggestion. Have added it in the list. Also @alfarhanzahedi, since this list will update itself frequently, it would be better to set this post on watching, so that you won’t miss the update’s that take place. @admin Could you please pin this so that more people view and vote for these suggestions? Add multiple session support (atleast) in Codechef Discuss. There are concerns from administration side regarding the same for the main site, but I don’t see a reason why Discuss should come under such restrictions. Right now(for this reply), I am logged into discuss through an old session, even though I am not signed into the main account (through google sign in). Is this a bug or a feature? If it is a feature, I am unable to sign via other session because of login limit in main site. So it would be good if it can take sample test case automatically (when I have selected question obviously) so I can run all of them in one click without copying. A feature of the old forum which has disappeared is that the star-rating of the poster is no longer shown. This is a pity, as the rating of the poster usually reflects the quality of the post, indicating whether it is worth reading. Is it the badges on this discuss forum that you speak about? If yes, I doubt the requirement of it as it focuses on a trivial benefit and would require lots of work to implement it. If you can explain the benefits of this feature and get some support(In the form of likes), I will add it into the list. This reply is not to demean your suggestion but to give you a valid reason on why I have decided not to add it in the list. Also various other more-important suggestions(like the one’s given above) need to be implemented before feature’s like these. Your suggestion is a nice one, but currently the discuss forum depends on Codechef login to get you signed in. But since you can login to Codechef through only 1 device at a time, you wont be able to access your discuss account simultaneously. It’s single sign on, to login to Discuss, you have to use authentication of CodeChef. On CodeChef, we have a single session policy, but that doesn’t apply to Discuss. Although, while logging in from the other device or browser, you’ll get a session limit error on CodeChef, where you have to select a session to continue with, but once you select session and login to Discuss, this won’t matter, i.e. you can login to Discuss from multiple device. @infinitepro has already posted how to do it. We have enabled it on Desktop mode on homepage. We are working on bringing the same to every other place where it’s not there. However, we have tried to show it wherever it’s possible. Have added the suggestion. Won’t the multiple polls cause confusion? Should I remove the polls from my post, or will you do it from your side?